When it comes to hot water systems, it’s always best to work with a trusted local plumber. Whether you want to install a new one, replace your old system, or have a faulty one repaired, the work will be done more quickly, effectively, and not to mention safely when you entrust it to the professionals. You may be able to do it on your own, but you might miss out on a significant element which a highly trained and experienced plumber would definitely remember to check. It’s also in your best interests to hire a local plumber instead of a plumbing company from other areas. For one, local plumbers are closer to you, meaning they will get to your location faster and promptly address any issues in your hot water systems. Even in the case of an emergency, they will be able to come to your home in short notice. The shorter travel distance also means they can give you lower rates because they have fewer and lower logistics expenses. And because local plumbers can give you a more accurate and affordable rate, you are sure to get more value for your hard-earned money. Another advantage of getting a local plumber to handle the installation or repair of your hot water systems is that they are more familiar with the locale. This means that they have a deeper knowledge of the weather conditions as well as the geography of the area, so they will know the most appropriate kind to install, be it a solar, instantaneous, gas, or electric hot water system. When you have the right kind of hot water system, you will be able to maximize its capabilities and save on your utility bills. Local plumbers are also more likely to understand your and your situation better because they well-versed with the community and its culture. They have also most likely serviced a lot of homes in the neighborhood; thus, they are familiar with common issues and this knowledge contributes to an even faster resolution of your hot water system problems. Being from the same area also means that it’s easier to build and cultivate affinity with them. When you trust your plumber, it’s easier for you to let them into your home to perform their jobs. 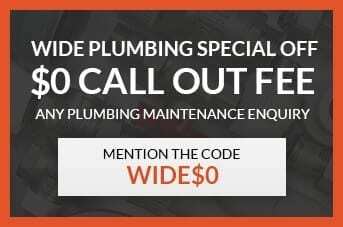 If you live in the Central Coast area and need the services of a local plumber for your hot water systems, give Wide Plumbing Services a call at 0419 012 750 or send an email to centralwideservices@gmail.com. You can rest assured that we will our jobs quickly and efficiently, with professionalism and honest pricing. There are many reasons why your hot water system may become faulty or damaged. The good news is that there are fewer parts that might be causing the problem; the bad news is that you most likely don’t have sufficient experience to perform a DIY fix. And besides, when it comes to an appliance that is as important as a water heater, it’s best to entrust the job to professionals. Here are some of the most common problems that homeowners often encounter with their hot water systems. If you experience any of these, call Wide Plumbing Services right away! Water Leaks. The tank of your hot water system may leak from both the top and the bottom. If it has leaks on the top, the most likely culprits are loose or broken inlet pipes or a faulty or broken temperature and pressure valve. If it has leaks on the bottom, it could be due to condensation or a leaking drain valve. Leaks in the bottom of your hot water tank may also be caused by excessive pressure or a corroded tank. No Hot Water or Not Enough Hot Water. If there’s no hot water flowing from your taps, it’s most likely that a heating element has failed. Depending on the kind of hot water system you have, your plumber may replace or simply clean the heating element. Meanwhile, the thermostat is the first thing you have to check if you don’t have enough hot water. You might just be setting it too low. However, if you already adjusted the thermostat and the problem persists, it’s possible that the thermostat is broken or the dip tube is broken or damaged. Low Water Pressure. The most common reason for low water pressure in hot water systems? Your home may not have big enough pipes in its plumbing system. You need 3/4-inch pipes, not the 1/2-inch ones that come with older homes, for ample water pressure. If you already have 3/4-inch pipes, check if the water inlet valve is fully open. Sediments can also accumulate inside your pipes, leading to low water pressure. Depending on the condition of the pipes, they may have to be cleaned or replaced entirely. Dirty or Smelly Hot Water. The main cause of dirty or smelly water is a corroded anode rod or hot water tank. Your plumber can quickly replace the anode rod, but the water tank is another problem. Your hot water may also emit a rust-like odour if there is a build-up of bacteria inside the tank. Quick fixes include turning up the temperature to about 60 or 70 degrees. If the odour persists, however, you might need to replace the anode rod or have professionals clean-out and disinfect the tank. Wide Plumbing Services can reach you wherever you are in the Central Coast. Just give us a call at 0419 012 750 or email us at centralwideservices@gmail.com for any enquiries. We promise to be at your property promptly and address any concern you may have with your hot water systems and other plumbing needs.